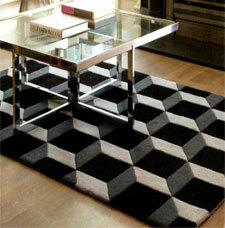 Geometric rugs are a collection of hand-tufted 100% wool rugs. The rugs as the name suggests feature clean geometric design patterns, which create a dazzling repetitive effect. Geometric is a luxurious collection also featuring a thick and dense wool pile that is soft to the touch.